Activation of long-chain fatty acids for both synthesis of cellular lipids, and degradation via beta-oxidation. ACSL6 plays an important role in fatty acid metabolism in brain and the acyl-CoAs produced may be utilized exclusively for the synthesis of the brain lipid. Translocations with the ETV6 gene are causes of myelodysplastic syndrome with basophilia, acute myelogenous leukemia with eosinophilia, and acute eosinophilic leukemia. 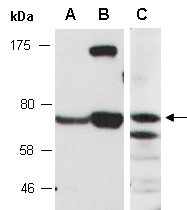 Rabbit polyclonal antibodies were produced by immunizing animals with GST-fusion proteins containing either N-terminal [ACSL6 (N) (R2712-1)] or the C-terminal [ACSL6 (C) (R2712-2)] region of human ACSL6. Antibodies were purified by affinity purification using immunogen. of human ACSL6 at RT for 2 h.